I like thrift shopping. A lot. 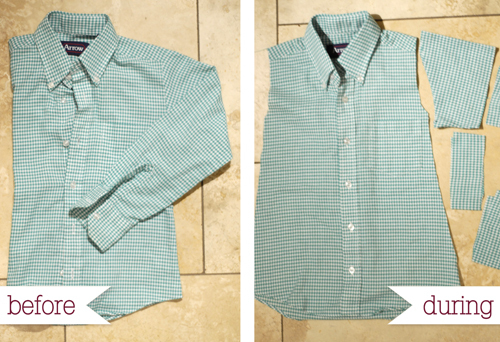 Last week I was in the little boys department looking for my favorite button-ups (for me) when I found the most adorable button up in greenish-teal plaid. I had to have it. It was a boy’s size 8, which is too small for me, and too big for Penelope. I bought it anyway. It was just too cute. Maybe Penelope will fit into it in 6 years? After I brought it home, I knew that in 6 years not only would fashion be different, but she’d be dressing herself by then. I had to make it fit her now so I could take advantage of my great thrift find. So, what do I always do? Make it work. This project cost $1 to make & took just under an hour. I would’ve finished it sooner, if Chris hadn’t started watching Lost. Sheesh. 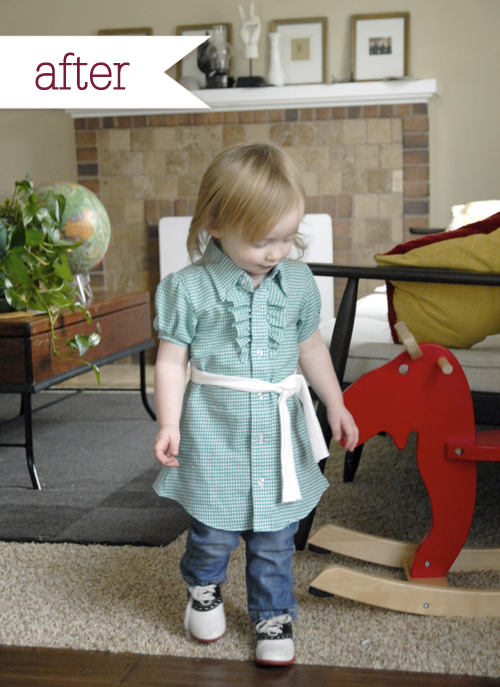 I paired her new shirt dress with skinny jeans (Check out Susan’s tutorial on skinnies) and saddle shoes on Friday (below) and then paired the shirt dress with bloomers, leggings and saddle shoes on Sunday (above). I love this color on her so much, but not as much as I love her. Ooo, she’s such a cutie. dear Melissa… please take all my old clothes that I hate and make super fabulous clothes for my kids. thanks! hehe. totally love this dress, girl. Penelope is a doll! That is super cute! And it helps you have a beautiful little girl. Thanks for always sharing your great ideas! Oh, too, too cute. Way to upcycle! You make the best ruffles. Inspired. GOing to the sewing room right now. Will emerge, no doubt, halfway through. As usual. So cute! 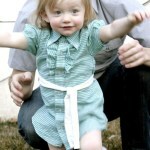 I am going to use some of my husband’s old shirts to make a couple dresses for my Lou! wow! that is too cute! i’m going to have to attempt this. but, this may be too advanced for my sewing skills. That is SO cute!!! Please teach me to sew?? I’m with Shanna…I’ll send you some old shirts, include some measurements and let you have at them! Adore the shirt dress and wish I could whip out something like that in less than an hour. It would take me all day! I love refashioning clothes. It’s my favorite project. I will definately be trying this. BTW I love your blog, you have such great ideas. Adorable! She’s looks like such a cutie. THIS is quite possibly THE cutest thing eva! Wow! Cute dress! SUPER DUPER cute kid! I hit the goodwill about every other Sunday after church…this is my next project! LOVE it – thanks for sharing! This is so adorable! If only this was in MY size! ;) What a cutie you have! Are you kidding me? This is too darn cute! Awesome!! How did you get rid of the pen pocket? Did you just unpick it or something? I actually didn’t get rid of it. It’s still on there. You can’t see it, funny enough, but I’m still trying to decide if I want it on there or not. I’ve unpicked pockets like this before, and they don’t take too long to do. oh i am so in love! i think i might have to go make one for my daughter… your creativity kills me! seriously.. amazing! oh my. that is adorable! Are you serious? So cute!!! I need you to make my little Kenzie one! Wow! I found your link from sara schmutz’s blog and I love it. I can’t believe that it came from an old shirt of your husbands. I am still unsure how you did the little ruffles in the front of the shirt. Amazing!! Thank you so much for the post! It helps us all out!